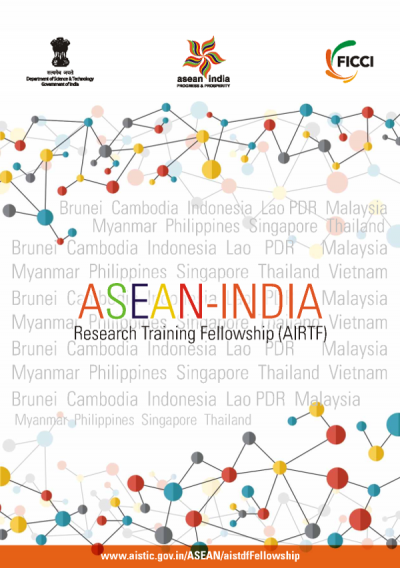 Fifty fellowships are available for young scientists and researchers under the ASEAN-India Research Training Fellowship Scheme (AIRTF), to study at Indian academic and R&D institutions. The fellowships are for a period of up to six months and include travel and financial support. The fellowships are intended to build capacity among young ASEAN researchers in science and technology and to further strengthen the bond between India and ASEAN member states. Fellows will have the opportunity to conduct research under the guidance of a host scientist in India in order to advance their own research capabilities while fostering scientific and technological cooperation between ASEAN and India. Applicants must be nationals of ASEAN member states, under 45 years in age and hold a Masters Degree in science, technology/engineering, medicine or allied disciplines. The area of research must be ASEAN-centric and aligned with the ASEAN Plan of Action on Science, Technology and Innovation, which includes the agricultural sciences. For more information, or to apply online, please download the attached AIRTF brochure or visit the ASEAN-India website.